Using the wrong technique during stretching can waste your time and increase your risk of injury. The levator scapulae runs between the upper part of the shoulder blades and the top four cervical vertebrae. If it feels as if somebody has hit you over the head with a baseball bat or pinned your arm behind your back during the night, your sleeping posture is probably working against you. PrescriptiveStretching incorporates large and easy-to-use full-color anatomical illustrations to demonstrate exactly how to relieve soreness and imbalances in a targeted way. 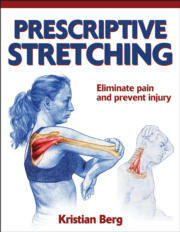 By using the 40 stretches in PrescriptiveStretching, readers can reduce their risk of injury and relieve unwanted pain. Whether you’re looking to increase range of motion or simply eliminate muscle pain and discomfort, Prescriptive Stretching has you covered. Comprehensive yet easy to use, it’s the guide you’ll turn to again and again. Kristian Berg is a doctor of naprapathy, a medical therapy that focuses on manual manipulation and stretching of the spine and connective tissues. He has managed his own clinic in Stockholm, Sweden, since 1988. Berg participates annually in international training courses in dissection, anatomy, and manipulative techniques. At his clinic he has shown more than 30,000 patients the importance of stretching and muscular balance for overall health. Berg is also the principal at the Personal Training School and a lecturer in anatomy at the Scandinavian College of Naprapathic Manual Medicine in Stockholm. He is a highly regarded speaker on stretching and athletic training in Sweden and throughout Europe. “Prescriptive Stretching teaches the correct techniques for achieving balance in the muscles."